Winter training is now an established routine and with a couple of consecutive 60 mile weeks and three Saturday & Sunday weekends I am happy it will be easy to re-establish after Christmas. Most of the last three weekends have been spent on the Winter Hill massif (seen left in yesterday's winter sunshine - here is hoping it is as benign at the Shooting Hut on Feb 11th) in contrasting weather. 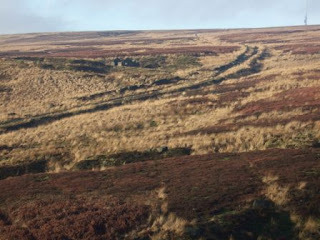 Saturday's frost and icy winds turned Winter Hill into tundra until the raiin arrived. Two weeks ago we ran in a blizzard to Great Hill while last week it was bright and sunny but with a wind so bitter it could have come from Holt's brewery. 50-60 mile weeks should be sufficient until the clocks change when another 10-15 miles can, more easily, be added. The most significant progression in training will be with the amount of climbing and descending. Currently, I am doing between 4000 and 5000 feet per week and that needs to, at least, double by May. Most of the increase will come from running in the Lakes reccing the route and the rest from different training routes in and around Horwich and Winter Hill. The other part of 'Winter Training' involves dates, schedules, support teams and all the other logistics that need to be handled and, as before, details will appear here as things firm up. About 9 miles and 2700 feet beyond a standard BG and it needs about the pace of a 21.5 hour BG to get round within 24 hours which means that I need to be stronger and faster than I was for my June 2006 attempt and everything - weather, food & drink and support has to be right. "Well, it depends if you want to do just any 55. I mean, you could do just any 42 but it wouldn't be a 'Bob Graham', would it? If you are going anti-clockwise it is not really a 55 without the North Western fells but it is up to you." So where do the North Western Fells come into it, I wondered? The additional summits are in bold and now it is obvious where the North Western Fells come into it. As ever, there are one or two surprises - Looking Stead & Scoat Fell seem too easy in comparison with the extra distance and climbing the first seven add but this isn't the time to complain. On June 2nd 1988, George Brass left the Moot Hall after 1,000 miles and 150,000 feet of training in the first 5 months of the year with high hopes of a 55 at 55. After 20 hours and nearly 50 peaks the weather turned and the attempt abandoned at Threlkeld. 23 days later back at the Moot Hall just before 9 am George was back for a second attempt. The weather was almost as unkind, having baked the ground, dried up many becks and it wasn't long before both blisters and a lack a water became problems. By Threlkeld the weather had had enough of being reasonable and reverted to rain and low clouds but it wasn't to stop George Brass reaching the Moot Hall within 24 hours having visited the 'standard 42' plus another 13 for a new 'peaks for years' record. What do you do at 55? I was tempted to ask "what to do after the Lakeland Classics?" but it was too contrived, even for me. Anyway, having previously considered a 12 hour "Joss Naylor" (JNT) to be beyond my reach and had it in the back of my mind to wait until the time allowed extended to 15 hours. The temptation of a 'new' age category is also lurking in the background but much as I enjoy long races (yes, it is possible to enjoy Ennerdale) it is long days out I really enjoy. So I started to lean towards a JNT until I had another look at the BG and much as the genie of the Lakeland Classics had shimmered out of the lamp another genie began to emerge, from I know not where, and I found myself wondering about another BG. I started to gather accounts and other details of extended rounds and realised it is perfectly possible to put together a 50 summit round, even a 55 summit round that is barely more difficult than the original 42 summits. For most people the biggest difficulty is the tradition of not tackling a 50 summit round until you are 50 and, of course, another 5 years are required before the 55 summit round. Being 55 only two years after my 42 summit rounds this is less of a problem. One way or the other another genie had escaped and another year's target crystallised. Route selection - actualy summit selection - took a bit of time and before I had finalised my choices I sought the advice of Paul Murray who has completed 42, 50 and 55 summit rounds. Extended Rounds are relatively rare with around fifteen 50@50s and 4 55@55s although there may be others I am unaware of but in comparison with the over 1300 members of the 24 Hour Club even the 50@50 completers are very few. "Why so few?" I asked Paul and with his enigmatic half-smile all he said "Well, it is all in your head". Persuaded this was an adequate explanation (although I am still wondering) I asked about route choice. This time his reply contained not a trace of enigma but it is, as they say 'another story' - to be told on another day. What do you do after a Bob Graham Round? That was one of the few questions to which I was able to obtain an entirely satisfactory answer in 2006. Most people, I suppose, revert to being 'normal fell runners' while others see a BG as, merely, a stepping stone to other things - a "Ramsay Round", a "Paddy Buckley", a winter attempt at any of these or any one of a number of long distance challenges that exist, particularly in Scotland. For my own part, I was especially interested in what others had done on the following year because I was going to have a huge void that BG training had occupied but more significantly I knew I was going to need a new source of motivation. In the immediate aftermath I had 4 rest days and started running again and two weeks later was back to 60 mile weeks, albeit not with the same amount of climbing. Part of the reason was because I had agreed to run the Langdale Marathon with my wife Pauline in September. We have three nephews who are have been singularly unimpressed with our running efforts. A typical conversation would go "What is the longest race you have done and how long did take you?" The Old County Tops is 37 miles over Scafell Pike and it took about 11 hours which only prompted the response "Whew, that is a long way but it is not a Marathon, is it?" So to be 'proper runners' we had to get the t-shirt and on September 24th we did. Still without an entirely satisfactory answer I began to realise that, like some many other answers, only a personal answer would do and so I started looking back through previous years' races and decided The Lakeland Classics Series would provide sufficient motivation for 2007 as well as providing another Grand Tour of the Lakeland Fells. A Grand Tour it is and one worth doing more than once, not just the Trophy which only requires 3 of the six races to be completed but the Series which requires all 6 to be completed. Even if you aren't looking for a challenge to ward off post-BGR blues I can highly recommend the Lakeland Classics.